Step inside the world of GNOG, literally, and it’s not hard to see why Double Fine – whose pedigree includes Pyschonauts, ’nuff said – chose to publish the mesmerizing independently developed puzzle game. The game recently released on PC, you can play it with a mouse and keyboard now. And it was previously available on PlayStation 4 (including the limited PSVR) and iOS, which is great, but the exciting bit here is that the PC version has VR support for Oculus Rift and HTC Vive. And it’s been worth the wait. First off, GNOG is absolutely gorgeous. VR hardware simply isn’t good enough to display photorealistic imagery that fools the human eye, and that means developers have to be clever with their artistic direction. Games such as Prison Boss, which utilize a cartoon vibe, tend to play well in VR. GNOG takes this concept to full advantage. The gist of the game involves inspecting puzzle boxes – in the form of monster heads called GNOGs – which contain a narrative puzzle. In VR you’ll use natural gestures to turn, push, pull, poke, and prod the GNOGs in order to unlock their secrets and move on to the next puzzle. Playing GNOG in VR feels like you’re inside of a cartoon that’s inside of a popup book, and I mean that in the best possible way. It’s such a magical aesthetic that it made me rethink the entire puzzle genre. On the surface, VR seems best suited for puzzle games in the room escape genre, but after fiddling with GNOG’s monster head dioramas for a few hours I’ve come to realize that I’m happiest when I’m a god. 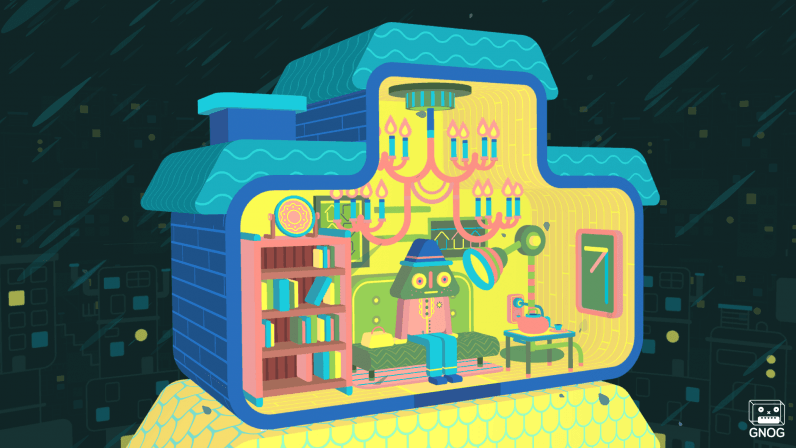 Instead of putting me in a room I’m supposed to want out of, GNOG invites me to enjoy the beautiful ambiance of a tranquil place that was designed to make me feel comfortable while I exercise my mind and explore a tiny, puzzling world. I can’t overstate how impressed I was by the surroundings in the game. Playing in VR truly was a meditative experience. The game’s music is excellent, the sound effects are compelling, and all of this comes together to make for a very comfortable and contemplative experience. GNOG lives up to the quality you’d expect from a game published by Double Fine, and it puts developer KO_OP on the map. You can purchase it on Steam now for $9.99 – at the time of this writing it’s on sale for $8.99, which seems like a steal.